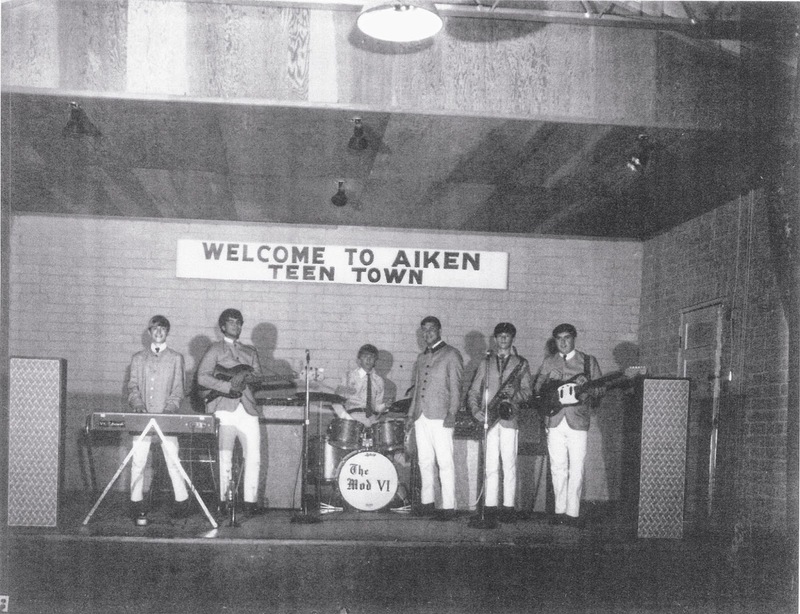 In 1968, if you were in the South Carolina area, the Mod VI were the band that you wanted to see on a Saturday night. With two regionally charting singles under their belt, this six-piece band from Aiken were opening up for the top bands that were passing through the Palmetto State, and looking towards larger stardom. However, like so many bands during that time, the draft derailed those plans, and the Mod VI were no more by the end of the 1960s. Thankfully, the story of the Mod VI did not end there. The band is reuniting for the Charlotte 60s Rock & Roll Reunion in Charlotte, NC. The show, the band’s first in Charlotte in 47 years, will feature the Mod VI alongside the Mannish Boys, the Kinksmen, and the Bondsmen, who themselves will be reuniting for the first time in 45 years. The Mod VI are also looking at releasing their original two singles, which have since become collectors items, and a CD of new material. Guitarist Bill Chapman talks about the history of the Mod VI, and the history to come. Daniel Coston: How did you get interested in music? Bill Chapman: Dennis (lead singer) and Johnny Gardner (drummer) had already formed a band in Jr High School called The Surfers. I joined the band and received thumbs up after auditioning playing the song "What I Say", by Ray Charles. We played a lot of west coast stuff back then; such as "Wipe Out", "Walk Don't Run", "Little Deuce Coupe", and “Sleepwalk". This was in 1964. This group developed our chops for later Rock & Roll. Dennis and I heard the Beatles on the Ed Sullivan show; that really got us started to play Rock & Roll. My Daddy started me playing the guitar when I was twelve. My Daddy and Grandaddy played guitar; my Grandmother played the panio, and my great Grandmother played the spoons (just like Granny Clampett from the Beverly Hillbillies!). As a family we played church hyms and country tunes. Coston: How did the Mod VI come together? South Carolina from Florida. Ted knew Ricky Peterson (original drummer). They joined Dennis and I. I knew Buddy Parker (original keyboard player) from jamming with him in another band. I ask Buddy if he would come on board with us and he agreeded. Buddy knew of a Sax player (Steve Bellamy). Steve joined, and we 0ffically became the MOD VI. Steve dropped out of the band after playing with us a couple of months; but we kept the MOD VI name. Coston: What were the early influences of the band? Chapman: Beatles, Rolling Stones, Kinks, Cream, Jimi Hexdrix, Paul Revere & The Raiders, & Chuck Berry. Coston: What was the music scene in Aiken like during that time? We were the Original Garage Rock Band in the Aiken area. We were the first to start playing hard rock. There were a couple of other bands around, but they played beach music. The MOD VI were different in that we put on a show to include over head projectors (psychadellic water colors); also used a variety of lights, including strobes. We played one song after the other (no breaks in between). Had a great repore with the audience. Seeing the Woggles recently remind me a lot of the early days of the Mod VI. Coston: How did your first single come together? What inspired the songs? Chapman: Our band wanted to write a song; so at practice one day; Dennis and I started discussing lyrics. Dennis came up with 'Baby It's Not The Same' in the writing of the song. This became our turn around lyrics for the song. As Dennis wrote other verses; it seemed to all fit together. We named the song 'It's Not The Same'; the keyboard player and I wrote the music. I would say we wrote the whole song including music in about thirty minutes. My guitar lead was influenced by Chuck Berry. Our primary influence for this song was the Beatles after listening to Sgt Pepper’s. Coston: The Mod VI toured a lot of places. How far was your touring range? Chapman: South Carolina, North Carolina, Florida, Texas were the main places. Coston: You’re told me that you managed and booked yourselves. Talk about that. Chapman: We had a original manager (Joe Poe) that financed our first record (It's not the same). Joe provided a venue for us to play at in South Carolina. Joe owned a large BBQ resturarant and had a large area in the back of the place where people could dance to a juke box. We started playing there and packing the place every time we played (about once a week). Eventually, Joe built a huge club that included a small bar beside his orignal resturant. The name of his place was 'The Rhythm House'. The MOD VI opened the new place, and once again packed the house. This was the only gig Joe got us. We would usually ride around when we didn't have a secure gig and go to clubs that had no bands for the evening and ask, "Can we play here tonight?" And usually they would say, "YES; 'come on in boys!” Most of the time we would be invited back for another gig. Also would carry copies of our record ("It's Not The Same”) with us, this helped in getting future gigs. We were primarily our own managers. We did use promoters from time to time; such as playing with Aurthor Conley, and Tommy James & The Shoundells. We had a local record store in Aiken at the time. The record store took a large amount of records from us and sold them and helped us promote the record thru several other avenues. We sold over 10,000 records. I guess back then that wasn't too bad for a local group. One final note, we bought all of our original band equipment ourselves. This included Guitars, Amps, Drums, PA Equipment and Bus. Coston: Tell me some road stories. Chapman:We played a week at the Old Dutchman club in Panama City, Florida. All of us were so excited about playing there and couldn't wait for opening night. When we first arrived, we threw our gear and clothes into our rooms and headed for the beach. We felt like the Beatles at that point (LOL); running on the beach heading for the surf. All of us jumped in the water exept for Dennis. I looked back and saw Dennis lying in the sand behind us. I went back to see what was wrong. He had stubbed his big toe on a small stake in the ground and while running to the beach (bummer!!). Dennis was in great pain, but soon shook it off an came in swiming. We rocked the club later that evening. We played a week at the Myrtle Beach Pavalion at Myrtle Beach, SC. During that week after playing each night, we had to drive back to Aiken, SC due to a summer school session that we had to attend. The summer school session was held from morning to afternoon and we played late at the pavilion. This was not a good combo for driving all those miles in one day. After playing late in the evening, we were tired and worn out, we headed back to Aiken. Back then there were no train track signals at the crossings before the train came thru. We crossed train tracks around 1:00 AM in a small town called Blackville. About 30 seconds after crossing the tracks a freight train heavily loaded with many cars rushed down the tracks behind us. Dennis was in the back seat of the bus sleeping while I was driving. I pulled over to the side of the road after crossing the tracks. Dennis woke up. We were both white as a sheet and thanked the Lord for keeping us safe. Dennis, Buddy and I were driving back from a gig in Folly Beach, SC around 1:00 AM. Our bus broke down as we drove thru a long swamp area. The only house around us was a little small shack about half a mile behind us. Dennis and I left the bus to walk back to the shack to see if they had a phone we could use. Buddy stayed in the bus. When we arrived close to the front yard of the place; two huge dogs came out of the shadows growling with red eyes shinning (just like in a horror movie). We ran hard back to the bus, with the dogs close at our heels. When we arrived back at the bus; we yelled 'Buddy, Open The Door' dogs are after us! Buddy yells back, "WHO IS IT???" LOL. Dennis and I had to climb on top of the bus untill the dogs left us. Coston: How did your second single come together? After releasing our first record, "It's Not The Same" we were invited to record in the Emrald Records studio in Greenwood, SC. We were playing a lot of Jimi Hendrix and Cream at that time. Those bands had a lot of influence on us as to heavy sounds (such as using the Fuzz pedal on the guitar solos). The two songs "What Can I Do" and "Show Me How" were both written within a hour. Dennis and I wrote the lyrics and music for those two songs together. Each member Ted Dubose (Bass), Buddy Parker (Keyboards), and Ricky Peterson (Drummer) had a lot of input as to arragements to include starting the songsand melody background. Coston: The Mod VI was poised for bigger things, and then what happened? And how did that lead into your next band? Chapman: Record discussions with Capitol Records was coming into play in 1969. We knew we needed a group manager to handle the technical details signning with a major label. We had contacted one of the better managers/booking agents in the Augusta, Georgia area. This major discussion/signing did not ever take place due to the ugly hands of Uncle Sam. Dennis received his draft notice and was inducted into the Army. I too received my draft notice a couple of months after Dennis. I joined the Air Force. Prior to me being inducted the Mod VI disbanded. A new group was formed with a new lead singer (The Acme Reposessing Company). We basically played all hard rock at that time. I played with the new group for about 4 months before leaving for service. Coston: Tell me about some of the bands that you shared a stage with, with both bands. Coston: Tell me about the Arthur Conley show, and how you just missed backing up Otis Redding? Chapman: Arthur Conley was a great showman and was a great guy to hang out with. He performed a lot of sweet soul music, and also a couple of 'Otis Redding' songs. My favorite Otis Redding song is 'Sitting On The Dock Of Bay’. Otis died the week before the Arthur Conley show. Coston: Tell me about opening for Tommy James & The Shondells. Chapman: We (The MOD VI) didn't really have a chance to talk with Tommy James & his band before the show. They stayed to themselves in a seperate dressing room behind stage. We opened up our show with our original lineup of songs, but we also added a Tommy James song into our act ("Mony Mony"). When we played this song, the crowd went wild due to being a big chart topper. After we completed the show many, many young ladies mobed the stage, tugging at our clothes. This was an awesome surprise to us since we were not the head liners. Tommy James and his crew/band was trying to get thru the crowd for their act but the girls/crowd would not leave the side of the stage that gave them access. Therefor, I'll have to say that Tommy James was really pissed off at us. They would not talk to us at all after the show! We all laughed for days after that event. Coston: What brought about the end of this second band? Chapman: The second band Acme Repossesing Company was formed after Dennis was drafted into the Army. At this point; a new singer joined the band. I played with them for several months before I was inducted into the Air Force. After I left Acme, a new guitar player came into the group. This group broke up due to the leader singer leaving the group at a later time. Coston: How did the Mod VI get back together? As it's been quoted by the Eagles, we never broke up, we just took a long vacation. All of us have been in touch with each other over the years. In 1985; we had a MOD VI reunion show in Aiken, SC. The show was a big success; we had several bands playing with us on the show (Aiken's mini Woodstock!). From that time forward we have played together and remained great friends. We've been practiceing a good bit over the past few months. Coston: What are the current and future plans for the Mod VI? Chapman: Rock the June 27th show in Charlotte, NC. We have been attending quite a few band shows in the recent months, and sitting in with the bands. Looking forward to playing on future shows and recording new material. We would really enjoying performing future events with The Mannish Boys, and other groups from the North Carolina area. Nice article! Can't wait for the Charlotte show in June!